Background: Glutathione peroxidase (GSH-Px) is one of the major enzyme in the antioxidative defense mechanism present in the cells. Methods: In the present study a novel and simple microplate-based method was developed, using the cupric neocuproine complex (Cu(Nc)2 2+) as a chromogenic oxidizing reagent, for the assessment of GSH-Px activity of biological samples for the first time. 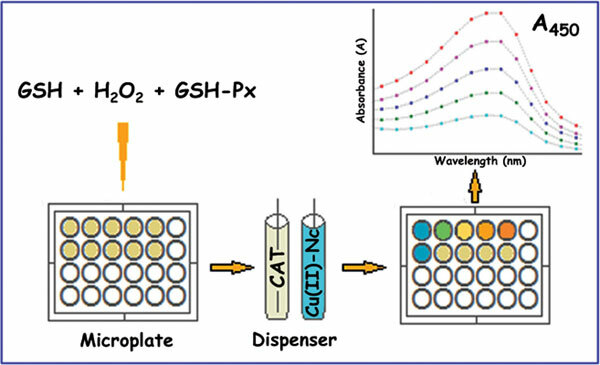 In this GSH-Px enzyme activity measurement, the GSH-Px catalyzed oxidation of Reduced Glutathione (GSH) gives rise to oxidized form of GSH (GSSG). The recommended method was based on the reduction of Cu(Nc)2 2+ to highly colored Cu(I)- neocuproine complex (Cu(Nc)2 +) by the unconsumed GSH, and measurement spectrophotometrically at 450 nm, the difference being correlated to GSH-Px activity of the analytes. Results: Under the optimum conditions, a linear calibration graph was obtained in the range of 18.5- 92.5 µM of GSH with Limit Of Detection (LOD) of 1.03 µM. Application of developed method to tissue homogenates (n = 9) provided GSH-Px activity values in agreement with those of the reference GSH-Px-5,5’-dithio-bis(2-nitrobenzoic acid) (DTNB) method. Conclusion: Cupric Ion Reducing Antioxidant Capacity (CUPRAC) antioxidant method was implemented in a microformat (96 well plates) and the reaction time of original CUPRAC method was significantly shortened from 30 to 4 min. Multi-sample can be simultaneously detected thanks to a novel microplate method. GSH-Px activity, microplate based method, modified CUPRAC method, biological samples, neocuproine complex, reduced glutathione (GSH).